Two posts in one day? I know, I know. But this was too good to wait. What a wunderbar (my dad always used to say that) Crochetville Secret Pal I have! 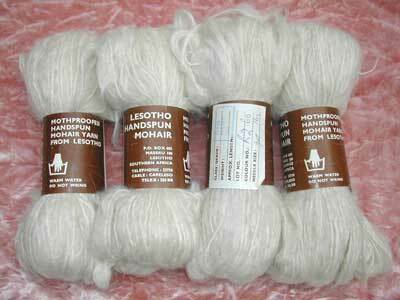 She sent me these four fabulous skeins of Handspun Mohair from Lesotho. It is gorgeous! The label says Super Fluffy and I wish every one of you could touch it and feel it. No, wait, I don’t want that many people touching my yarn, LOL. Whee! The excitement of thinking about what I might make with it. I love the planning stage of doing a project, thinking about all the different possibilites. Any ideas? *envious* .. i think a nice mobius scarf would be wonderful out of that ..
Ditto: How did your Crochetville pal get a hold of the skeins? Did they go to Lesotho for them? Gorgeous yarn! Can’t wait to see what you make with it. 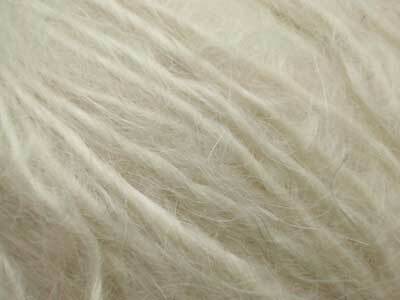 …That mohair looks really interesting! I found you while browsing for news about Lesotho, I’m particularly interested in textile facilities, and textile production in Lesotho, but there is not much on the internet … would you be able to help me get some up-to-dated info on production, investments, co-operations in Lesotho? or address me to some source of infos? How did your Crochetville pal get a hold of the skeins? Did they go to Lesotho for them? I agree…a lovely warm scarf. Then again, I am in a scarf mood at the moment. that is some gorgeous yarn!! Wow Donna from Lesotho ! Now I will have to send you something form Benin to compete :-) ! (I am leaving tonight for a two year fellowship). I think the yarn would make a lovely scarf, and a warm hat…or a stole maybe? Anyway have fun with it! WOW! That’s all I can think to say! WOW!